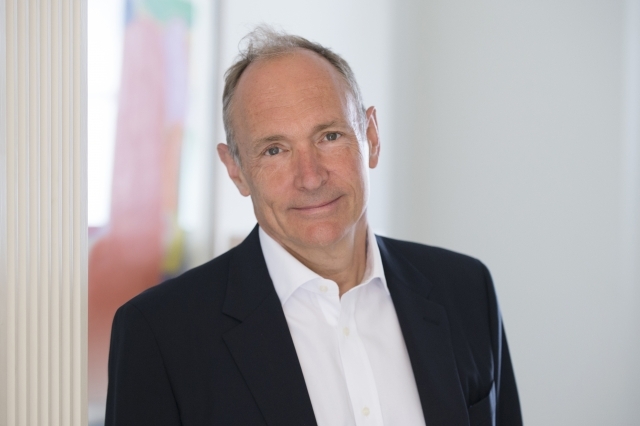 On the happy occasion of Professor Sir Tim Berners-Lee’s receiving the Turing Award, I’ve reflected on some of the most important lessons I’ve learned from Tim over the years. Three stand out: simplicity, leadership, and faith in humanity. Simplicity: The Web has grown into an extraordinarily complex, global technical, economic, political and cultural colossus that has changed almost every aspect of life on the planet. It didn’t start that way. At the beginning, Tim’s design for the Web it is really quite simple, both in the underlying technology and what it took for anyone to put up a website. Early Web sites were mostly text, images were sparse, perhaps a small sound file, and hardly any video in sight at all for the first few years. Yet the web grew extraordinarily quickly, because it was easy for any person to add a web page, to link to other pages, and easier still for users to browse around the web. While the web started small, Tim had in mind from the beginning a design that could grow to be, in fact, ‘world wide’. The simple structure of HTML meant that anyone with basic computer skills could write their own web page. And because web server technology was based on the simple protocol HTTP, it was easy to launch a new web site on your own server on someone else’s. Add to this the fact that Tim made it so that everyone used one naming/addressing convention for web pages (the URL), meant that everyone who put up a web page was instantly part of a global dialogue. Tim’s passion for simplicity led him to pare down the then-current designs for hypertext system (information systems in which different pieces of documents or data are linked together) into something that was much simpler than was being built by leading computer companies (Apple’s hypertext) and academics. In fact, Tim’s design was so simple that a paper he wrote describing the early design of the Web was rejected from the leading academic conference on hypertext systems (h/t Wendy Hall). Tim brought to the design of the Web the insight that simplicity scales. If you want to build something global, it better be possible for lots of people to build individual pieces of it. This is a lesson that I believe he learned from the designers of the Internet. But Tim came to it long before Zuckerberg, Bezos, etc. Leadership: The Web grew not only because of its elegant design, but also because Tim created and still leads a small but global organization, the World Wide Web Consortium (W3C), that develops the technical standards for the Web. Tim created W3C and shaped his unique role as Director with the help of other leaders including (to name only a very few) Michael Dertozous, Jean-François Abramatic, George Metakides, Nobuo Saito, Albert Vezza, and many many others, including the great team that works there. As Director, Tim has the somewhat obvious leadership role of assuring the W3C technical standards remain consistent with the basic architecture of the Web. Tim’s vital leadership though is actually more about the community ethos and process of the W3C. Just as he has fought to maintain the architecture of the Web against various threats, he has also built a global community of technical leaders and designers who are empowered to evolve Web technology driven by the needs and creativity of those who are actually building the Web all around the world. Tim has not only been a leader, but he has empowered generations of technical leaders who have themselves led the expansion of the Web into areas such as video, complex graphics, accommodation to make the Web work well on mobile devices, and expansion of the Web to include all of the languages of the world, not just those written in Latin characters running from left to right across the screen. Tim’s leadership has been about not just preserving his only brilliant idea, but inviting others into the process of developing it together with him. Through Tim I have learned that wise leadership of a community of people sometimes entails accepting results that go contrary to your own personal views. Early in the development of the Web, Tim turned his attention to the question of how to represent data, as opposed to documents, on the Web. By the late 1990s, the Web was reasonably good at sharing and linking documents, enabling people to discover and remix text and images from around the world. But structured data inside spreadsheets or databases was opaque to the Web. You could share a link to a whole spreadsheet, but not a specific column of data or formula inside the sheet. This severely limited the ability to discover information that was hidden across a number of spreadsheets or databases, and Tim wanted the Web to tackle that problem. Together with a small group of computer scientists lead by Jim Hendler, Tim hatched the idea of the Semantic Web, based on a technology called RDF. At the same time, a large group of web developers were working on a different approach to this problem using a technology called XML. There was large community support behind XML but RDF and the Semantic Web had yet to prove itself. It was probably within Tim’s power as Director W3C to advance his favored design over the wishes the community, but he refused to do this. Instead, he allowed the process to develop, recognizing the community support for XML even though he thought it was not the best direction for the Web. While RDF has not yet completely swept the Web, it has been an important part of opening up government data to use on the Web, through efforts such as the Open Data Institute, founded by Tim and Nigel Shadbolt. For Tim leadership sometimes meant insisting that the Web community solve problems that many would rather ignore. From the early days at W3C there has been a commitment to assure that Web technology is accessible to people who are blind, deaf or have other permanent or temporary disabilities. Considering these additional technical design requirements may have added time to the development of standards in some cases, or put pressure on companies to spend the resources necessary to assure that their products meet basic accessibility needs, Tim has always viewed this work as a vital part of designing the Web, and the world is richer and more inclusive for his insistence that these issues be addressed. The Turing Committee itself recognized that Tim’s (and CERN’s) decision to make Web technology available on a royalty-free basis was key to the Web’s success. The initial decision to forgo what might have been a lucrative early sale of Web technology bucked the then-standard trend to patent and seek license fees for software. Maintaining this position took Tim and W3C as a whole to the brink of an existential crisis for the Web. As the Web became more commercially-successful, some companies, including leading members of the W3C, thought it might be profitable to patent key web technologies and then demand royalty payments. At the same time, many Internet companies were being sued when they deployed web technology. And free and open source software developers who were the builders of essential pieces of the Web’s infrastructure — the Apache web server (open source), the Firefox browser (open source) and Linux operating systems (free software) on which much of the Web is hosted — felt threatened that they might be left out of licensing deals and unable to support the Web. Faced with the choice of either acceding to financial pressure from the commercial powerhouses of the Web, or losing the open source energy that had been critical to the Web’s global reach, Tim called on the entire Web community to take a long view of the issue and find a sustainable path forward. Tim held the community’s feet to the fire for almost four years until we reached a consensus conclusion. The result was that hundreds of companies and major open source and free software developers all agreed to dedicate intellectual property rights they held to keeping the Web open for all to develop. Have faith in people: Above all, Tim’s invention of the Web reflects his faith in people. I have come to understand his motivation for designing the Web and determination to keep it open and universally-accessible, as a belief that if you give humanity a platform on which to share information, ideas, culture and everything else, that good things will happen. Yes of course, there will be hate speech, there will be extremism, there will be fake news, all manner of other material that some of us find offensive. There will even be criminal conduct and new venues for terrorists to organize. Despite all of that, Tim has taught us to focus on the expansion of opportunity, of political discourse, access to scientific knowledge, and tools with which to innovate. We can all look around the world and see the ways in which the Web has enriched our lives and our communities. From the very beginning of the Web, critics have come forward to question Tim’s decision to create a universal Web, in which all aspects of humanity will be able to show themselves. By designing the Web to represent all of humanity, Tim posed a challenge for all of us. As a decentralized medium, no single authority can filter out the bad and save the good, even if we can agree on what that would be. Instead, Tim has shown us that we all have to be engaged together in the universal space that the Web creates, for we are all engaged together on this planet anyway. The ACM Turing Committee recognized Tim’s technical achievement “inventing the World Wide Web, the first web browser, and the fundamental protocols and algorithms allowing the Web to scale.” At the same time, they recognized that the importance of the Web is in its universal reach, as much as its technical elegance. Thanks, Tim, for the Web, and the lessons in humanity along the way.